When November sets in all cold and grey, there’s one thing to really look forward to nonetheless—all the lights and magic of the holiday season. As Quebecers settle in for another winter, they also look for opportunities to immerse themselves in beauty and fun. 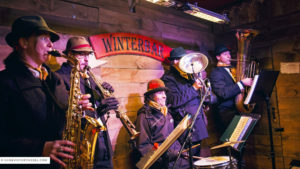 Since 2008, the German Christmas Market, which runs this year from November 22 to December 23, has become one of the most hotly anticipated winter events in the city. But why a “German” market? Does Québec City really have a discernable population with German roots? The Hôtel Château Laurier Québec concierge team decided to look into this question for you! According to some genealogists, one in ten Quebecers has some German ancestry. The first German immigrants arrived in Québec City in the 17th century, in the days of New France. Some who started families saw their family names Frenchified over time (Bernhard became Bernard, Deigne became Daigle, and so on.). However, it was during the American Revolution (1775–1783) that German immigration really hit its peak, with over 1,000 officers and soldiers of German descent settling in Quebec after the war. And another wave of immigrants arrived in the aftermath of World War II. More recently, the tech sector has drawn young German families to the area. At the turn of the millennium, there were about 2,000 first-generation German immigrants in the greater Capitale-Nationale region. Although relatively few in number, Québec City residents of German descendant are a very active cultural group. Founded in 1946, Cercle Goethe presents monthly talks and literary and musical events to an audience of Germans, Alsatians, Swiss, Eastern European immigrants, and Germanophile Quebecers. Deutsche Sprachschule Quebec also offers German language courses to people of all ages. Communauté Allemande Québec is a group whose mission is to promote German culture in general, including its customs, music, literature, films, history, and language in Québec City. The organization participates in various local events, including the Festibière de Québec beer festival, where it sets up a Bavarian-style beer tent—a nod to Germany’s storied brewing tradition. 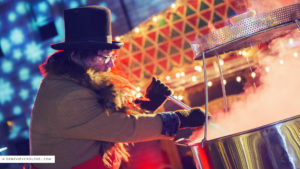 And most notably of all, since 2008, the square and gardens of Québec City Hall have come alive every holiday season with a bustling German Christmas Market. In Germany, every town and village has its own Christmas market where locals come together to stroll, eat, play, shop, and stock up on gifts. 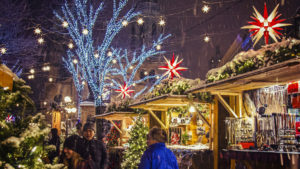 In keeping with this tradition, Québec City’s German Christmas Market recreates this cheerful and enchanting atmosphere as faithfully as possible—much to the delight of thousands of locals and out-of-town visitors. 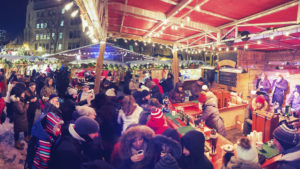 From November 22 to December 23, against the beautifully illuminated backdrop of Old Québec, an alpine chalet, outdoor stages, and some 80 wooden booths will be set up so that market-goers can enjoy all the warmth and cheer on offer from the various vendors, restaurateurs, and artisans. Germany may be the star of the show, but you’ll also find some of the best products Québec has to offer. 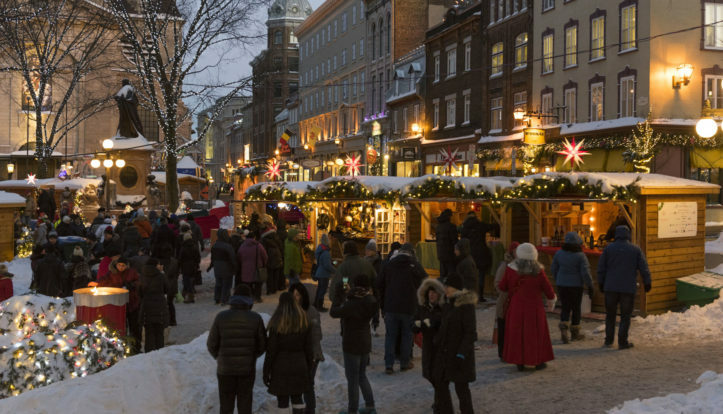 There are many ways to get the most out of Québec City’s German Christmas Market. You can simply stroll around and see what catches your eye, or you can plan your outing based on what’s going on at the market. Various activities and shows are scheduled in November and December to celebrate the finest German and European Christmas traditions. We’ve picked out a few that might coincide with your stay in Québec City! To kick off the first weekend with a bang, Bavarian trio Kaltentaler Alphornbläser will fill Old Québec with the impressive sounds of the alphorn November 22 to 25. Fun fact: Québec City’s German Christmas Market even features a special event for canine companions—the Weihnachtshundeparade (dog parade), which will be held on November 29 and December 7. 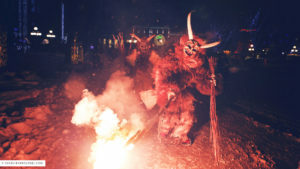 Ever heard of Krampus, the horned figure who frightens children who’ve been naughty rather than nice? A show inspired by this creature out of European folklore will feature music and pyrotechnics on December 7 and 15. Or if you’re more interested in stories about the origins of the Christmas tree, yule log, Christmas cards, and other holiday folk traditions of Europe and North America, you won’t want to miss the captivating Der Meistererzähler on December 2, 15, and 22. The Der kleine Weihnachtschor choir will enchant fans of traditional Christmas music. This small choral ensemble will perform carols from Germany (and other parts of Europe) and Canada on December 9, 14, and 22. Moreover, let’s not forget the Feuerzangenbowle, a flambéed mulled wine that’s as intriguing to see in the making as it is delicious to drink. This typically German libation will be served starting a few days before Christmas on the evening of December 21. Children are also in for a treat with Kinderchalet Ravensburger, an area created especially for kids where they can play and take part in activities free of charge while the Christmas Market is open. A Christmas market isn’t a Christmas market without festive food. And this one is chock full of German specialties you’ll love discovering or rediscovering, including pretzels, Stollen (German cakes), gingerbread, and the always-comforting Glühwein (mulled wine). Young and old alike can enjoy a bite to eat at one of the many stands serving up Swiss fondue, jumbo hotdogs, charcuterie, terrines, rillettes, cheeses from near and far, sweets, waffles, macaroons, chocolate, nougat, and maple products. There’s something for everyone. While you’re there, why not pick up a nice bottle of cider, Québec certified wine or berry liqueurs? They make a fantastic hostess gift when you’re invited to a gathering. This festive Christmas village is also a great place to find original gifts sure to please. Artisan vendors from Europe (naturally with strong contingent representing Germany and Switzerland) and various regions of Québec occupy many of the approximately 80 wooden booths. Visitors will have plenty of opportunities to find local and international handicrafts, including soft knitted shawls, ceramic houses, handmade jewelry, herbal products, blown glass creations, scented candles, alpaca wool socks, works of art, original ecofriendly products, and more. 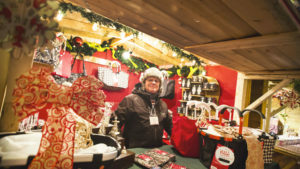 In short, Québec City’s German Christmas Market is a great place to find fabulous gifts for everyone on your list—family, friends, coworkers, even customers! Whether you’re a Québec City regular or a first-time visitor, the concierges at Hôtel Château Laurier Québec will be happy to do anything they can to make your life easier. Feel free to call on us whatever your wants or needs and tap into our extensive knowledge of the city and its surroundings. We’ll be more than happy to help you find what you’re looking for so you have more time to make wonderful memories. Looking for a place to stay? Hôtel Château Laurier Québec offers attractive packages to make your stay even better. Plus, Hôtel Château Bellevue, our sister hotel, is a partner of the German Christmas Market. Check out their special package.